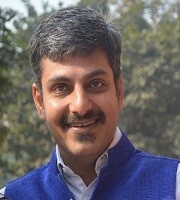 Dr. Nipun Vinayak, born and educated in Chandigarh, joined the IAS in 2001 after an MBBS with gold medals from Government Medical College. During his training at the LalBahadurShastri National Academy of Administration, he got many awards including the ‘Director’s Best All Round Trainee Award’. His professional achievements include recommendation of his work as CEO Zilla Parishad, Jalna for ‘Prime Minister’s Award for Excellence in Public Administration’ by Government of Maharashtra and first prize in the State in ‘Rajiv Gandhi Abhiyaan for administrative reforms’. He believes that good governance is about the 3Ps – Passion, Participation and Partnership. Calling himself a ‘participative and facilitative development learner’, he cherishes engagement of people in various development projects. He has authored books on sanitation (‘Beyond Sanitation’ published by YASHADA, Pune) and on innovations in education and health (Gramodaya, published by UNICEF, India). During his tenure as CEO, Zilla Parishad, Jalna, he converted sanitation programme into a social movement involving not only the government officials, but also elected people, women, media, religious leaders etc. He is recognized as a sanitation champion, both nationally and internationally and has promoted community approaches in sanitation in his various roles in the rural areas (as CEO, Zilla Parishad, Jalna) and in urban areas (as Municipal Commissioner, Nanded). During his tenure as CEO Zilla Parishad, Jalna, the district moved up in education status from amongst the lowest in the State to the top. Many of his innovations were replicated at the State level. He would sit with all the 5000 teachers in his district in groups, holding day long discussions and motivating them and facilitating cross learning - in effect installing pride in their hearts of being teachers and unleashing their potential. Many innovations were carried out in the public health sector as well, which reduced the infant mortality by close to 50 per cent in two years. He travelled extensively in most of the thousand-odd villages in his district, spending nights there. Villages became his second home and villagers his family. He considers love of people as the invaluable treasure. 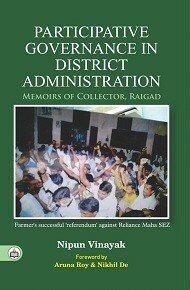 As Collector, Raigad, experiences of which tenure are documented in this book, he found himself embroiled in what media termed as the ‘first referendum of India’. In these battles which were fought in courts, government and streets, people emerged victorious against one of the biggest Corporates of India. As Municipal Commissioner, Nanded, he prioritised working with, and for, the slum dwellers envisioning and effecting, to a great extent, a clean city. As Director of the national programme, Swachh Bharat (rural), he is working incessantly towards reorienting the programme from a supply-driven latrine construction programme to a community led and community driven collective behaviour change programme. He has travelled extensively across the country to more than 20 States. He currently stays in New Delhi and likes to draw portraits in his free time. He can be contacted on vinayaknipun@gmail.com.